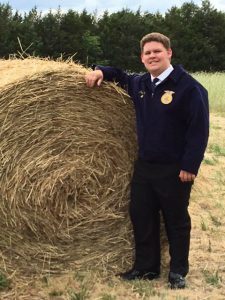 Meet Paul Eldridge, an FFA member whose SAE revolves around producing and selling vegetables in his community. Not only is he able to provide food for his family, he is also able to invite consumers out to his farm in North Carolina to pick their own vegetables and view their impeccable garden. Best of luck in your enterprise, Paul! Anyone can start a business and succeed! Matt Brechwald is the founder and show host of Off-Farm Income, a podcast that profiles agricultural entrepreneurs, including FFA members to those operating businesses to support their own farms. Matt, his wife Autumn and their daughter Hattie also own a small, agricultural service business and operate a 25 acre farm in Kuna, Idaho.